I had a fantastic workout routine today with one of my very best friends, however, I must admit that his fitness condition is way superior than mine and, somehow, he has become one of my role models. That made me think about all situations in life when on occasions we find ourselves in a context where our knowledge or skills are better than the ones around us, some other times, our position may not be as favourable. And surely, we have had come across a number of scenarios where we find our match, either for a cooperative or competitive situation. After leaving the secret program where he was trained to be a survival and a killing machine, Evan decided to keep his life in seclusion, surrounded by the most sophisticated security possible and taking care of leaving no trace of his presence anywhere. A man that does not exist. But it is not like he became a monk or the hermit on the hill. He became a paladin to help those in desperate need, those defenceless in critical and unfair situations. Subject to a strict set of rules, Evan can be contacted by anyone in a such unwanted situations through a phone number that will be given by another person already helped. One case at a time and with all possible precautions. Yeah, it all sounds good: Evan, you’ve got the job of your dreams and the purpose of your life, haven’t you? On very single case, he has faced, so far, dirty guys that were no match for his skills and they wished, if alive, not having crossed his way ever. But one good day somebody will be good enough, with the correct background, with the adequate resources and the strong will to balance – or overturn – the equation. Evan, the Orphan X, will see each of his operational rules broken and deal with the consequences of that. A desperate Latin woman, her neighbour, the daughter of an addicted gambler, an illegal immigrant. Who’s with him and who’s against? That’s for the reader to find out in a page turner novel that I strongly suggest to start right before your days off work. 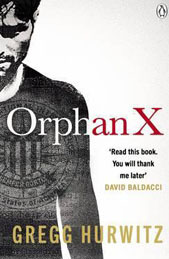 Martial arts, psychologic games, weaponry and much more is given with no reserves on this book and, if you were looking for that story that will make you feel miserable after finish it and will make you ask for more, ‘Orphan X’ is the right choice.